A Source/Measure Unit, or SMU, is a source and measurement resource for test applications requiring high accuracy, high resolution and measurement flexibility. SMUs are sometimes also referred to as source monitor units. An SMU can precisely force voltage or current and simultaneously measure voltage and/or current. Keysight Technologies is the leader in the Source/Measure and Source/Monitor Unit (SMU) market. Keysight provides a wide range of SMU products, which are categorized into four areas: Precision, Application Specific, General-Purpose, and Basic. 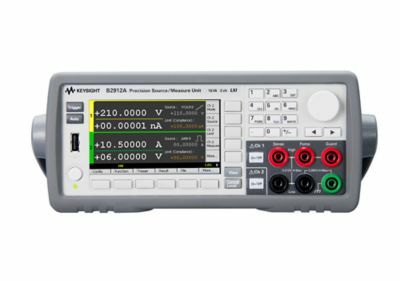 Keysight B2901A Precision Source / Measure Unit (SMU) is a 1-channel, compact and cost-effective bench-top SMU with the capability to source and measure both voltage and current. The N6705C from Keysight offers 5 instruments in one to precisley charatcerise to battery powered devices in order to increase battery life. The Modular, 600 W, 4-slot mainframe holds up to 600 W of total power and up to 4 modules. More than 30 DC power modules to choose from (modules ordered separately). Can be configured as a Voltmeter, Ammeter, Arbitrary waveform generator, Digitizing Scope and a Data logger. Only Keysight’s N6780 Series SMUs let you visualize current drain from nA to A in one pass and one picture unlocking insights to deliver exceptional battery life. Designed to plug into the N6705C DC Power Analyser allowing you to precisley charatcerise battery powered devices in order to help reduce battery drain on battery powered devices. Ex-demo less 25% discount with approx. 2 years manufactures warranty. Ex-demo less 25% discount approx. Keysight high performance power supplies N6705C and N7900 series, can be operated on the bench as a standalone unit but in order to get the full performance and analysis from your equipment it should be used in conjunction with 14585A or N6705C-056 Control and Analysis Software. This software licence is installed in the instrument and therefore can be connected to any computer, on any bench.